Description: An international conspiracy has placed the UK's most secretive bio-chemical project into deadly hands, and only Her Majesty's most lethal agent, James Bond, can unravel the mystery. To navigate through layers of corruption, you, as Bond, will embark on a global chase that will have you battling on land, sea and air through Athens, Istanbul, Monaco, and Bangkok. Nothing is what it seems as each adventure reveals a deeper and more sinister conspiracy. 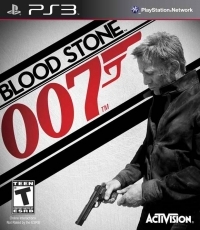 A mix of third-person gunplay, hand-to-hand combat and the driving action, James Bond 007: Blood Stone features Daniel Craig, Judi Dench and Joss Stone. The game features various modes and multiplayer mode for up to 16 people. Engage in precise cover-based gameplay and tactical firefights, and speed your way through explosive, adrenalin-fueled driving sequences. Become Bond as he engages in intense hand-to-hand combat and uses his environment to finish off enemies.